Gianni Bugno (Italian pronunciation: [ˈdʒanni ˈbuɲɲo]; born 14 February 1964) is a former Italian professional road racing cyclist. 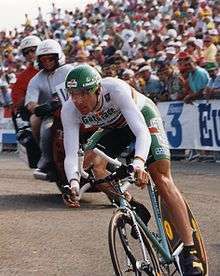 Bugno was a versatile rider, able to do well in different types of races. 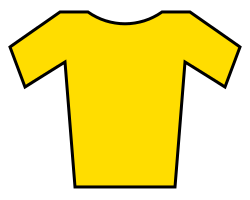 He won numerous stages in the Tour de France, and the Milan–San Remo classic in 1990. In 1991 he won the Clásica de San Sebastián, and in 1994 he won the Tour of Flanders. 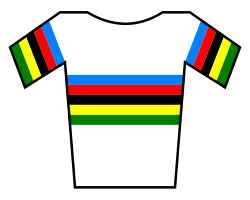 Bugno's greatest success was the double victory in the World Championship. In 1991 he beat Steven Rooks of the Netherlands and Miguel Indurain of Spain, and in 1992 finished ahead of Laurent Jalabert of France and Dmitri Konyshev of Russia. Bugno's performance in the Grand Tours, however, was over-shadowed by Miguel Indurain. Bugno's victory in the Giro d'Italia in 1990 is considered one of the most dominant performances in that race — he led from start to finish. While he won the Giro in 1990, he finished second to Indurain in the Tour de France in 1991 and third behind Indurain and Claudio Chiappucci in 1992. In a battle in the 1992 Tour, Indurain kept his calm despite Chiappucci's attack in the Alps; Bugno had to chase and cracked in the final parts of the stage. Indurain was quoted as saying that Bugno was his biggest threat in the Tour. Bugno retired following the 1998 road season and is now a helicopter rescue pilot. He piloted a camera helicopter for the Tour of Lombardy, on 20 October 2007, and for the whole of the 2008 Giro d'Italia. He ran for a seat in Lombard Regional Council in the Lombard regional election, 2010 for the centre left coalition of political parties but he was not elected. He has remained involved with the Giro d'Italia by being one of the TV helicopter pilots for the Italian national broadcaster, RAI. He is the president of CPA (Association of Professional Cyclists). In November 2012, in the wake of the Lance Armstrong doping scandal, he demanded that an independent anti-doping body be established. He stated that the UCI could not be trusted to enforce the rules.